I love Fall! No, really, it is, by far, my favorite season. I love everything about it – the cozy clothes, the crisp air, the warm colors, the delicious smells and the food. To be fair, we don’t really get fall until October here in Coastal North Carolina – we’ve got at least another month of 80 degree weather – but I’m all about starting early. I mean, even Starbucks will have their Pumpkin Spice Lattes back at the beginning of September! 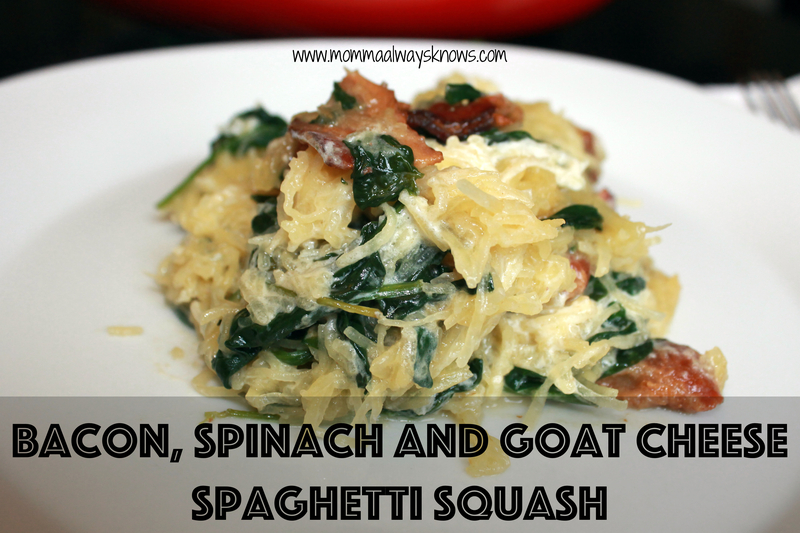 I made this dinner earlier this week and, besides being a HUGE hit with my husband, it screamed Fall Flavors to me! This is one meal that will certainly be entering the rotation on a consistent basis. 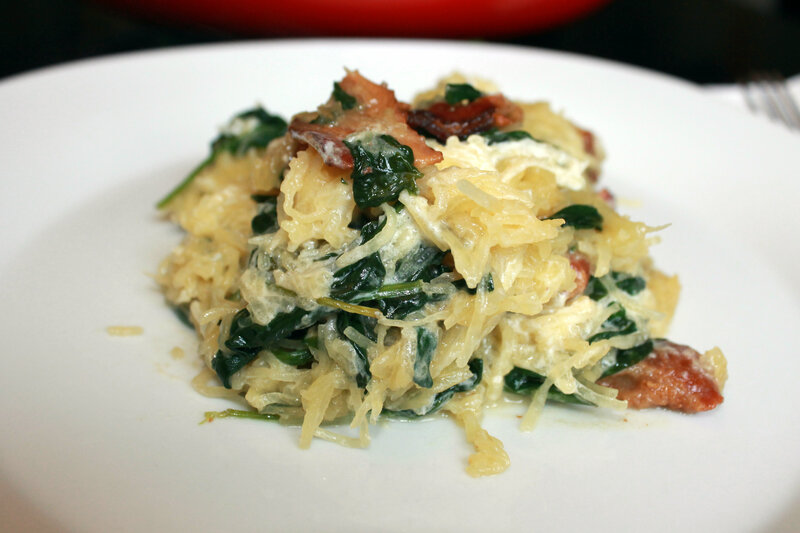 And the best part, it’s gluten free and fairly healthy – I mean, as healthy as bacon can be! 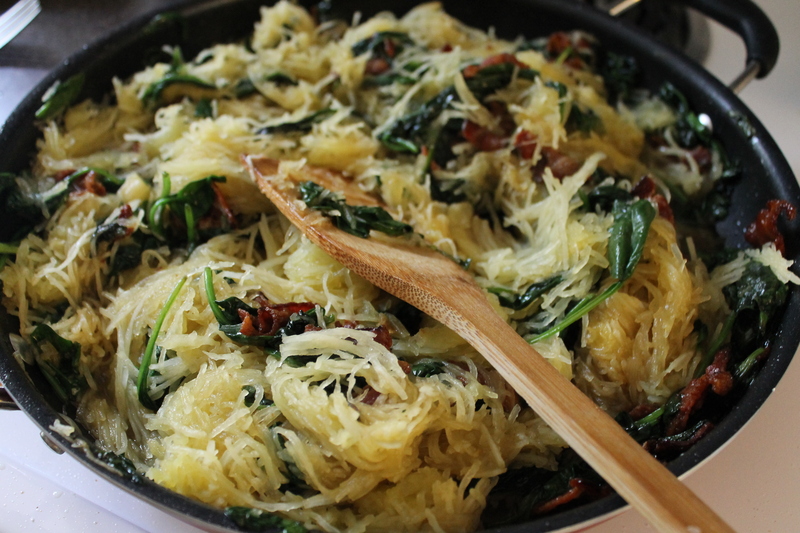 Start by cooking your spaghetti squash. There are several ways to do this. I prefer to put each squash in the microwave for 3 minutes each. After that I slice with a knife and place seed side down on a baking dish lined with foil. I roast at 375 degrees for 30-40 minutes. Once they are cooked I remove, flip over and let cool. 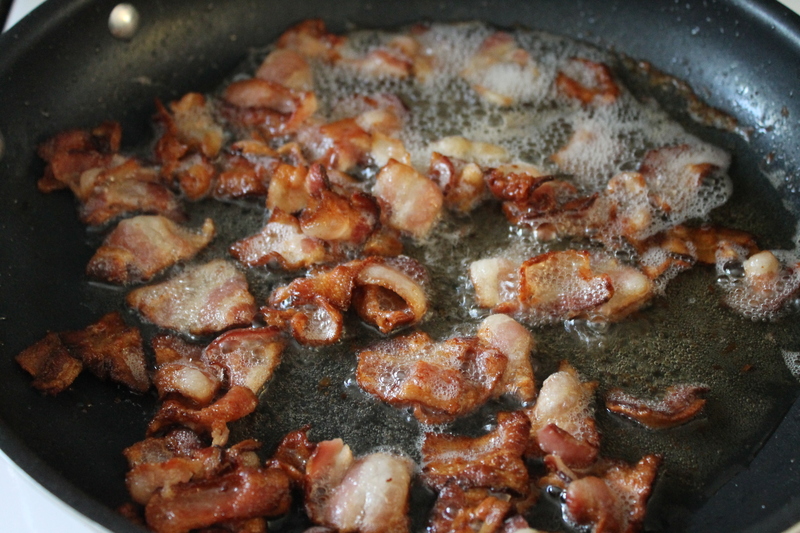 Chop your bacon into 1 to 2 inch pieces and cook over medium high heat until crispy and then lower the head slightly to render off the rest of the fat – about 4-5 minutes to crisp and another 5 or so to fully cook. Add the balsamic vinegar and scrape up any bits from the bottom of your pan. The bacon grease will most likely splash up at this point, so be careful! Stir in the maple syrup and the thyme and cook for about 45 seconds or so. 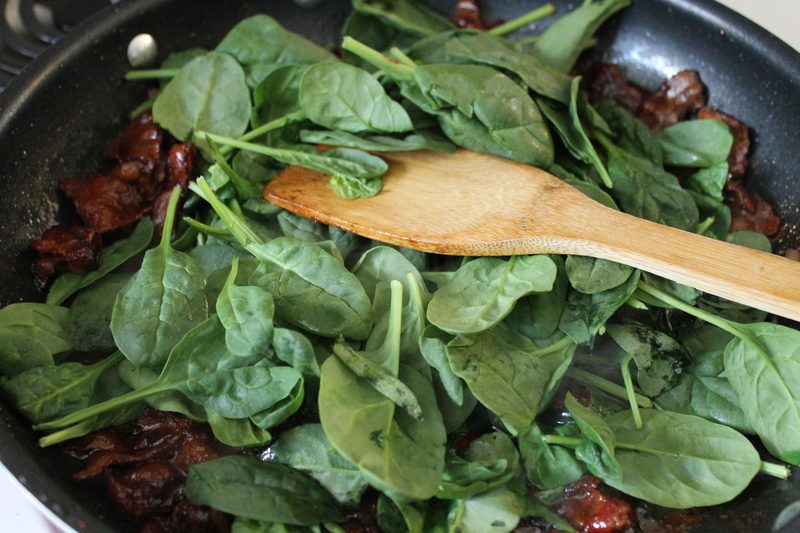 Begin adding your spinach in batches. Cook until wilted and there is more room in your pan before adding more. 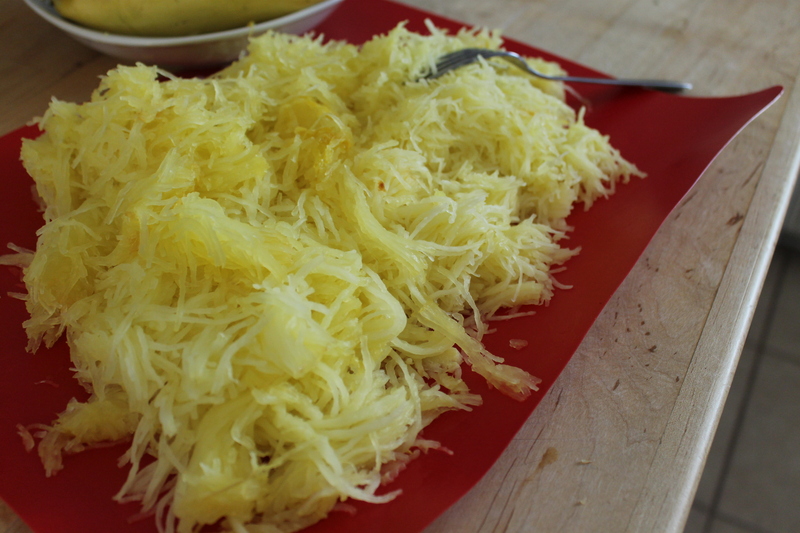 While I was doing that I was multi-tasking and scrapping my squash into “noodles” with a fork (remove the seeds and discard first). I laid them out flat on a cutting board and salted at this point too. 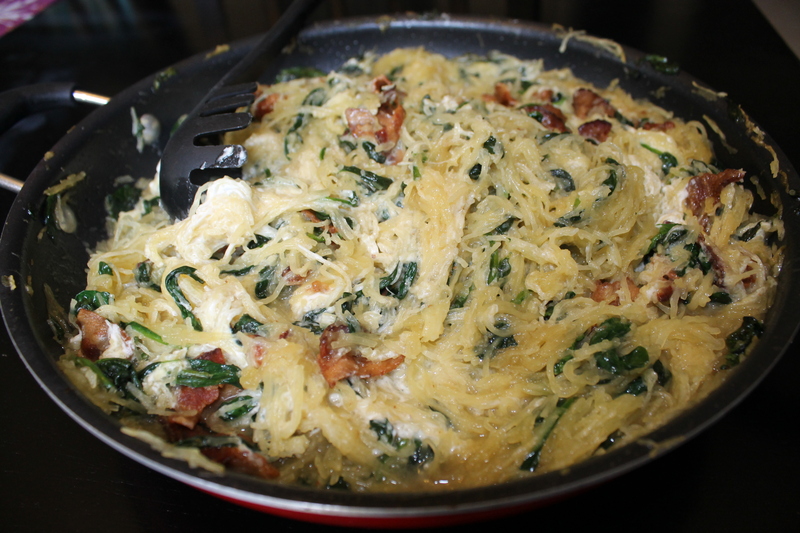 Once the spinach has all been added and wilted, add in your squash and stir. Lastly add in the goat cheese and stir to combine. Serve immediately and be prepared for the praise – this meal is delicious! **I got the original recipe from Buzzfeed and you can find it here.